Does the internet disrupt all media…or just print?. In the 1990′s, belief in disruption led to exaggerated claims about how the Internet would change everything – even replacing retail stores. Reality, consumer behavior, common sense, and the dot-com bust intervened. Retail stores are now stronger than ever – and they leverage the strengths of internet based communication. Still seeking disruption, the claim was narrowed to media. And there has developed among the internet advocates and their co-religionists in media companies a nearly unshakeable belief that the internet is disruptive for all media. They find a foundation for their belief in the current chaos in print media. Then they extend that disruption to all media – especially television. But there is strong evidence that TV won’t suffer that level of disruption. Consider the example discussed in this NYTimes article. Here, a homeowner opted into the belief that the internet would disrupt TV. So he turned off cable and wired himself up for TV via internet. Then, after a year of struggle has returned to cable. Speaking of money, Wired Magazine this month claims internet TV is a 50% savings over cable. Except, they conveniently include a bunch of optional and expensive cable packages. When you construct a more reasonable package, using Wired’s assumptions it looks like TV via Internet is only marginally cheaper – (20% to 30%). The cost equation will only get worse. As TV viewing consumes bandwidth, our infrastructure will have to expand and that will mean new and higher internet costs. Plus, programmers will have to start to charge for things that are free today online (note that Hulu has just begun charging for their programming). In reality, fees for accessing programming online combined with fees for bandwidth could easily EXCEED today’s cable fees. So let’s hope that the Internet doesn’t disrupt TV – because it will likely replace the costly with the outrageous. Instead, the internet and TV should grow together. 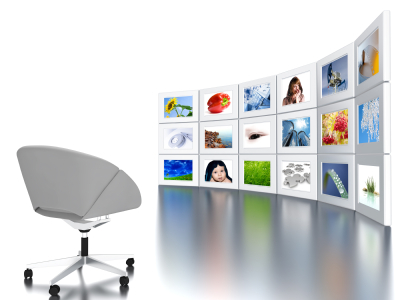 Evolution of the current internet and TV structures has the potential to make our viewing time more productive. They can do so by leveraging the strengths in the existing systems for creating and distributing programming as well as the advertising that supports that programming (studios, networks, cable systems, advertisers). An impact like this is similar to the impact the internet’s had on radio. Satellite distribution and iPods have had more impact on radio than the Internet. And, distribution over the Internet has extended radio audiences – proving to be a nice expansion and not disruption. It’s also not so far off from the internet’s impact on music – although the picture in music is more complicated. The early days of sharing sites like Napster created tremendous angst. And music retail has nearly disappeared. But to the consumer, the music business in 2010 looks a lot like the music business in 1985. The content creation system hasn’t changed. The big labels dominate. A tiny number of artists break out without labels. Pop stars like Justin Beiber are manufactured by the studios. An electronically released album is structured just like a traditionally released album. And consumers have faster and better access to what the labels create. And so, what is the future of TV? Clearly the internet is merging with TV in some way. But I don’t think it’s going to be disruptive. Consumers know what they like from TV. And that has made it exceptionally resistant to disruption. VCR’s didn’t do it. DVR’s didn’t do it. The internet will probably bring more change – but not that much more. So let’s abandon the disruptive hoo-hah and turn our focus to marketing fundamentals: Figure out how TV can evolve to improve consumer viewing experience and deliver it.